The Surf and Sound Quintet in performance at All Saints Episcopal Church in Southern Shores. The Bryan Cultural Series is one of the local organizations that helps to make the Outer Banks such a special place to live and visit. 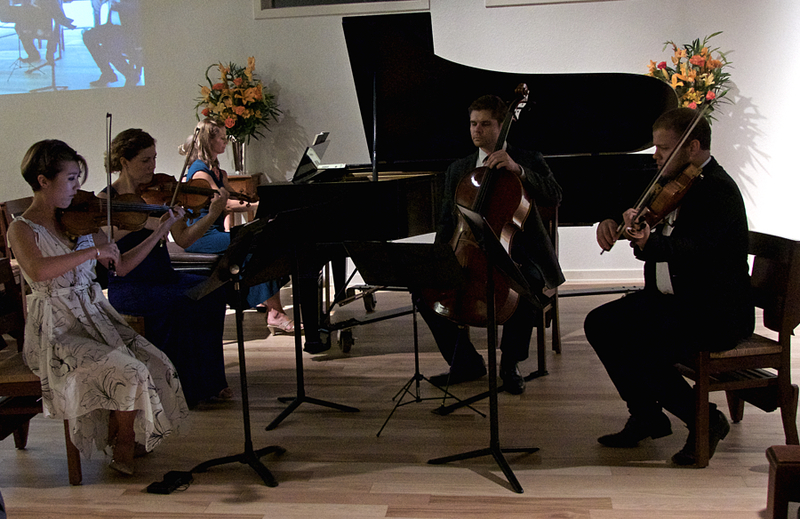 This is the week for the Fourth Annual Surf and Sounds Chamber Music Series. Bringing five musicians with well-deserved international reputations to the Outer Banks, the Cultural Series is sponsoring four free concerts beginning Tuesday, August 21 at All Saints Episcopal Church in Southern Shores at 7:30 p.m. The music is classical music and in past years the performances have been breathtaking—wonderful interpretations of the music. The Wednesday performance will be at the Town of Duck Amphitheater, at 6:30. The performance in Duck will be a string quartet—the fifth instrument in the quintet is a piano, an instrument that does not travel well. The last two performances will be at Cape Hatteras Secondary School on Thursday, and a Friday evening performance at the Dare County Arts Council Gallery in Manteo at 7 p.m.
A playbill for the performances has not yet been made available, but in the past the musicians have presented a wonderful collection of compositions, ranging across centuries to include Haydn and Mozart then venturing into the late 20th century a contemporary sound. By all means, check out the outdoor performance at the Duck Amphitheater. There is something magical about listening to great musicians perform some of the most remarkable music ever composed in an outdoor setting. The Bryan Cultural Series has truly come to the fore in brining great performances to the Outer Banks and their next performance may be their most ambitious and genoursy yet. In cooperation with Elizabeth R and Company, a free performance of La Traviata will be presented on September 15 at First Flight High School. There is always something worth checking out on the Outer Banks. Check out our Joe Lamb, Jr. & Associates homes for the best locations.